Where summer camp meets science, technology, engineering and math, and students embark on a learning adventure that’s part theme park and part classroom. There’s no doubt that STEM subjects—science, technology, engineering, math, and by extension their related disciplines—are immensely important for the 21st-century classroom. But for the 21st-century student travel experience? Sure, science- and math-themed destinations have been around for a long time. But not many of them are ready to host a generation that’s grown up with technology, video games and the Internet. 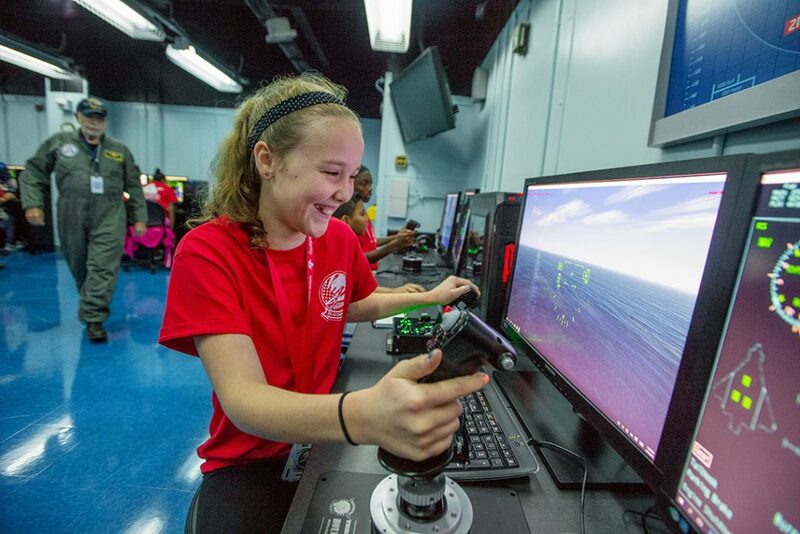 That’s why the Naval Aviation Museum Foundation (NAMF) launched the National Flight Academy (NFA), an immersive and interactive learning camp for middle and high schoolers. Now, let’s be clear about what the National Flight Academy isn’t. Despite its name, it’s not an actual flight school; students don’t learn to fly airplanes or acquire a learner’s pilot license. And although it is located adjacent to the National Naval Aviation Museum – home of the world-famous U.S. Blue Angels – this Pensacola, Florida institution is not part of the U.S. Navy, the government or any of the Armed Forces. Back in 1993, the Naval Aviation Museum Foundation began to focus more on educational programs to get young people interested in science, math and related subjects. This led to the creation of several programs, such as Kids Day in Antarctica and Kids Day in Space, as well as special programs for teachers. Eventually, a program called Flight Adventure Deck emerged; this interactive aviation exhibit taught kids about aviation, aerodynamics, propulsion and meteorology. In 2011, the National Flight Academy was created, combining special events, single-day learning experiences and multi-day camp programs with the goal of encouraging students to excel in STEM subjects. Ideally, after students complete their stay at NFA, they’ll want to explore science, math, engineering and technology more in their own school system. And though we are considering this from a traditional school perspective, it’s good to know that the NFA is ADA compliant and that other groups—such as kids’ clubs and homeschoolers—are welcome too. Although much of the NFA’s programs are designed for kids in grades 5-12, there are several offerings for younger students. Single-day Adventures introduce students from kindergarten and up to STEM subjects via learning about drones, hurricanes and tsunamis (among other topics). Another program, STEM Saturday, immerses kids in grades 3-8 in a world of science-related topics. Some upcoming themes include: Exploring the Speed of Sound; Ocean Survival; Jets in Flight; and Robotics and Future Technology. STEM Saturdays include various hands-on activities, including lab work, simulated flight, machine building and robot design. 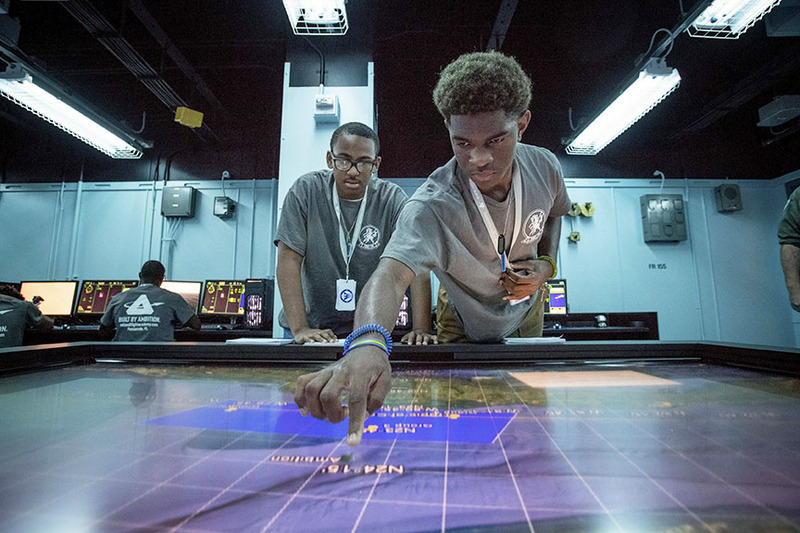 In addition to day-long learning adventures and special events throughout the year, the NFA offers two overnight camp programs available for up to 216 students: three-day Cruises and six-day Deployments. 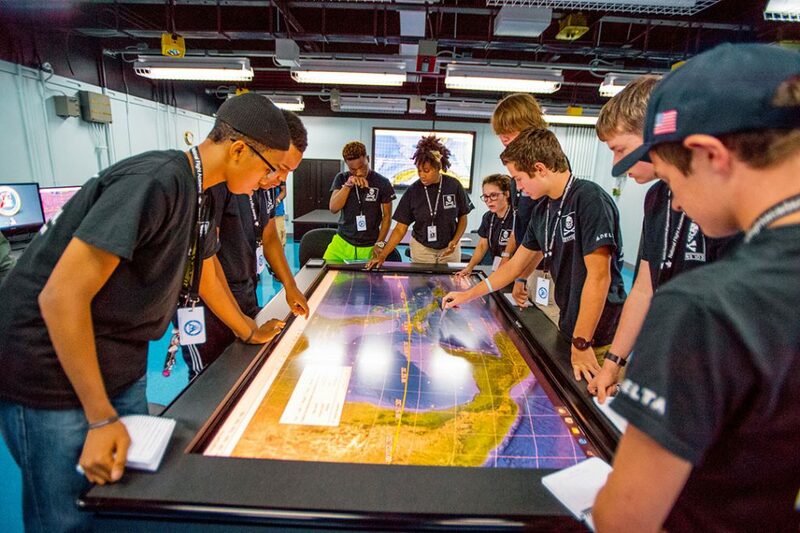 Three-day Cruises are designed to whet students’ appetite for STEM subjects, particularly in an aviation setting. This program can also be considered as a lead-up to the longer, six-day Deployment program. Both programs have students stay overnight, summer-camp style, and both feature an immersive learning experience mapped to state and national math and science standards in an interactive, engaging storyline. During their Cruise, students will form teams and work together to complete various missions, including immersive, theme park-like thrills and flying a simulated aircraft. This introduces them to several principles of aerodynamics – including thrust, hovering and target drops. It also encourages students to build up their knowledge of meteorology, math, physics, bathymetry (measurement of water depth) and ballistics, as well as to work on those essential 21st-century “soft” skills of technological comprehension, communication, innovation, teamwork, problem-solving and critical thinking. Instructors are on hand to offer guidance and encourage kids to complete their various missions. 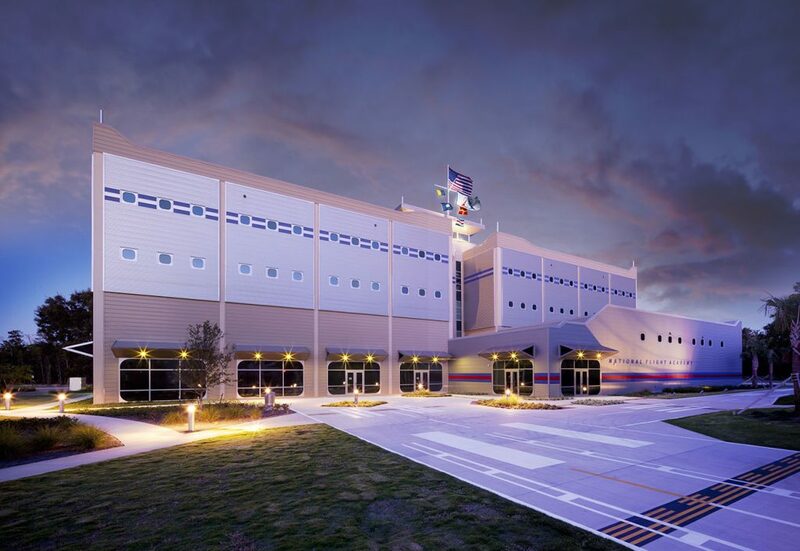 Of course, meals and sleeping accommodations are provided, with 24-hour closed-circuit TV security coverage of all areas of the facility. In addition, trained staff and a Registered Nurse remain on site at all times in case of accidents or other medical needs. Deployments are full-on, six-day experiences where science camp meets naval aviation. During their stay, students participate in an immersive, virtual-reality-augmented environment that includes races and rescue missions. Various STEM core competencies are covered, including meteorology, navigation, flight planning, physics and technology. Deployments are open to kids who have completed fifth grade (i.e. going into sixth grade) up to those entering or in 12th grade. During the program, students are given the role of naval aviator and are given access to flight simulators and other high-tech equipment. They’ll be asked to complete things like rescue missions (non-violent scenarios only). The problems students are asked to solve become more challenging as the days roll by, and students are encouraged to further develop the communication, critical thinking and collaboration skills introduced earlier. Getting kids engaged with STEM subjects can be difficult. The interactive experiences offered at the National Flight Academy grab kids’ attention and are designed to spark a lifelong love of learning about science.